Andy Hunter fits naturally into the surroundings of a local coffee house, casually dressed in a bright yellow Diesel ski jacket. He sips his hot beverage, makes easy, thoughtful conversation and remains focused, like an old friend, pausing only to greet his wife, Helen, in a warm British cadence, their son, Ethan, quietly in tow. At first glance, there is something delightfully incongruous about this picture. No one looking on would guess this same man is a world-class DJ cranking out pounding bolts of electricity in many of the hippest clubs around the world. But to Andy, this is just the multi-textured harmony that's life. 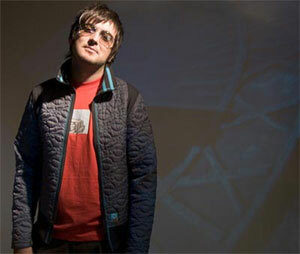 Life releases as the newest project from internationally acclaimed UK artist, DJ Andy Hunter. The six-song EP, produced and arranged by Hunter and Tedd T. (Stacie Orrico, Delirious?, Rebecca St. James), offers sonic vignettes of Christ bringing new life to barren wasteland. It's a powerful metaphor urging the church to engage in intercessory prayer, extending hope where there is despair. The record maintains Hunter's signature ambient sound, supported this time by a liberal use of guitars and live stringed instruments. Through innovative rhythms and beats, Life illustrates a worshipful expression of total surrender and freedom in Christ unlike any record you'll hear this year. Hunter also adds his vocals to the album, as well as guest vocalists Kate Westall and Neil Wilson. The collection satisfies great anticipation among music fans brought on by the breakout success of Hunter's 2002 project Exodus. That highly acclaimed dance record catapulted Hunter into the upper echelons of mainstream dance music. "Amazing" became a crossover hit while tracks such as "Go" and "Wonders of You" garnered major placements in film and TV, including The Matrix: Reloaded (trailer), The Italian Job, ABC's hit "Alias," plus video games, including "The Matrix" and "Black Hawk Down." Further, with media like Rolling Stone giving Exodus props and endorsements by Microsoft for national licensing and promotion opportunities, Hunter found himself touring the U.S., Japan and Europe with top names in the dance music business. For an artist like Hunter-who'd worked some eight years in relative obscurity-the experience was like seeing your favorite Southern California Christian rock band suddenly opening for U2. Hunter, however, refused bragging rights. In fact, the notoriety makes him somewhat uncomfortable. His music isn't about achieving fame, he says. It's about expressing who he's meant to be in Christ. "It's not about a style of music, it's about a lifestyle," he says. "To me it's about a love relationship with Jesus," an expression of living daily with Christ through prayer, study and worship. It's Hunter's desire to bring others into their own intimate experience with God. "The more we fall in love with Jesus, then the more natural to our lifestyle acts of worship becomes. So, I'm a DJ. I'm into dance music, so whatever I'm writing is an expression of worship to God. Through our art, we're communicating-communing-with God. I want to get out pieces of music that capture people's attention, not necessarily a lyric, but an atmosphere or a feeling that expresses the heart," he says. "Now, I'm having fun. I'm having a ball while I'm doing this," Andy acknowledges, his sense of humor shining through. "It's not like I'm Mr. Serious Spiritual Guy. But it does mean I've got an ear open to what God might be leading, an eye toward where he may want me to go. I want to put myself where God can use me." Hunter's grateful for his mainstream opportunities, but what satisfies his soul remains his church work. He's most drawn to the young Christian who is also a techno music enthusiast. That's typically a teenager who is discovering for the first time that art that moves them can also intersect with their faith. The experience begins a vision for living life, work and faith as one. Even today, Hunter leads worship regularly for a small church near his home in the fishing town of Mumbles, off the south coast of Wales. More broadly, Hunter's music is regarded as a staple resource for church progressives engaging in emerging worship styles-future-forward, multi-sensory alternative worship approaches aimed at 18-35-year-old Christians. "When young people hear this style of music in or around church, it immediately connects with them and it's freeing to them. It helps them express themselves to God, and it helps them feel accepted by the church." Hunter hopes Life will connect with all types of audiences looking for new ways to express their love for God. "For me, being a DJ isn't about being trendy. It's an act of worship and inviting people to enter in," Andy says. "The focus is on God. It's about leading people into new places with music they haven't heard before. But I see God working in art like this, and I'm encouraged to see God doing a new thing."